I was surprised to see pumpkins at my local Wal-Mart on my last trip, the farmers market can not even give me a date that they will have them but yet here sits pallets of pumpkins ready to carve! 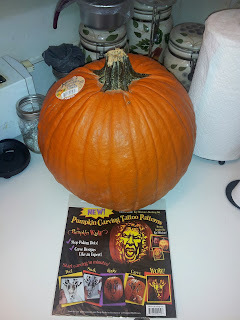 I bought one not even having a plan as when I would have time to carve the pumpkin or what design I would attempt on it but for $4 I would figure something out. 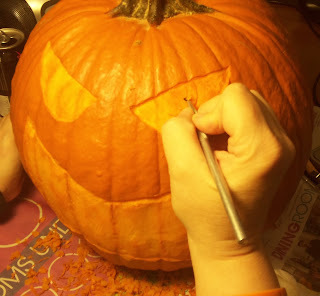 When I got home, I dug through my carving supplies until I found my pumpkin carving tools and designs that had been put away for months. I also found this Ray Villafane carving tattoo that I bought last year and forgot about, has anyone tried one of these yet? 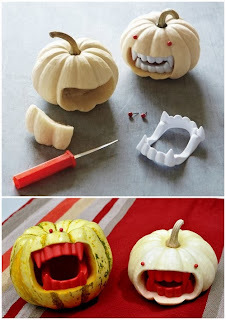 I might just try this pumpkin carving tattoo and do a video review of it to see if it truly is easy … what do you guys think? If you haven't already, check out Ray Villafane's Pumpkin Carving ... it's quite awesome! I entered my Monster High themed fruit bowl from my last post into an online watermelon carving contest & would love if you guys would go vote for me! 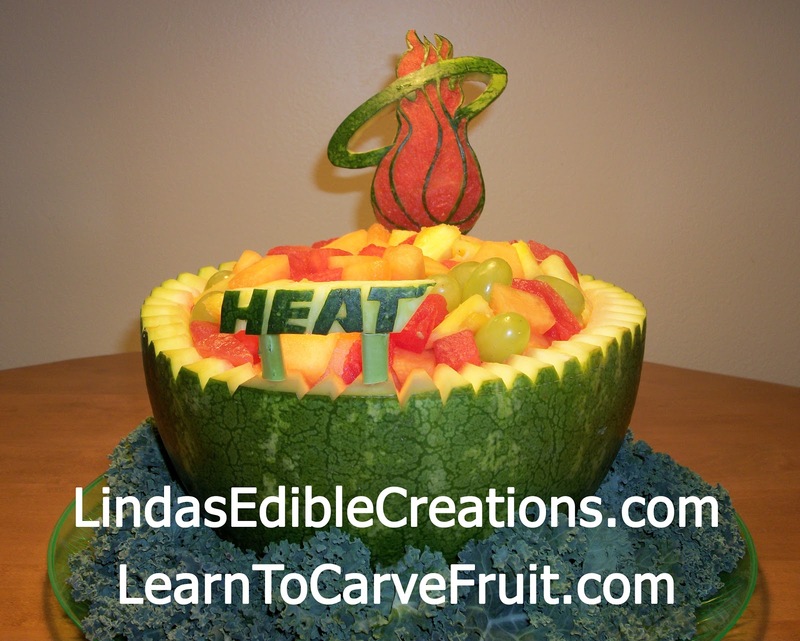 Follow the link below and the voting is on the right side and they labeled my entry a simple "Watermelon Bowl", Thank you everyone! Monster High theme fruit bowl carving I did for my niece's birthday party two weeks ago. 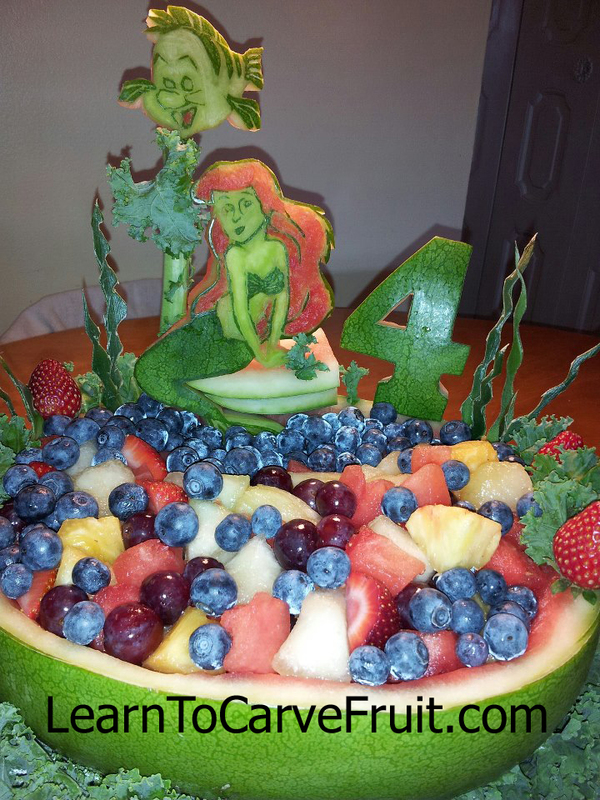 This is a photo of a watermelon fruit carving I did last weekend of Ariel and Flounder in a underwater seen with the number 4 for the birthday girl. 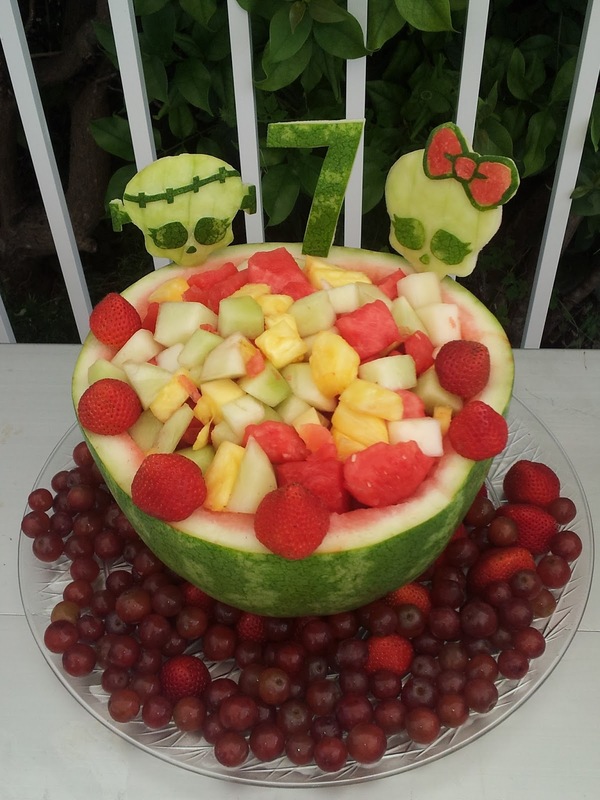 Watermelon fruit bowl baby carriage, not only is it a great baby shower food idea but doubles as a table decoration too! Please subscribe to me on YouTube and share my videos to your friends. I put together a play list of my romantic fruit and vegetable garnish YouTube videos to share with everyone. 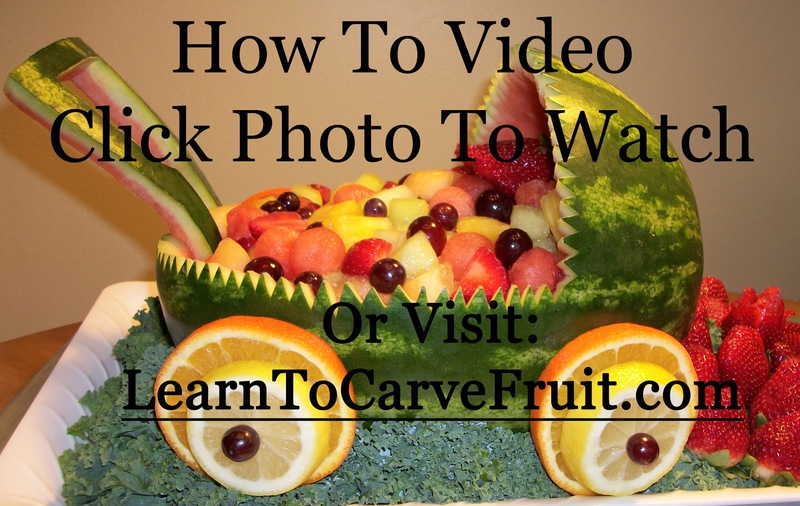 These four videos are full of fruit carving and vegetable carving ideas that would be perfect for a Valentine's Day dinner. 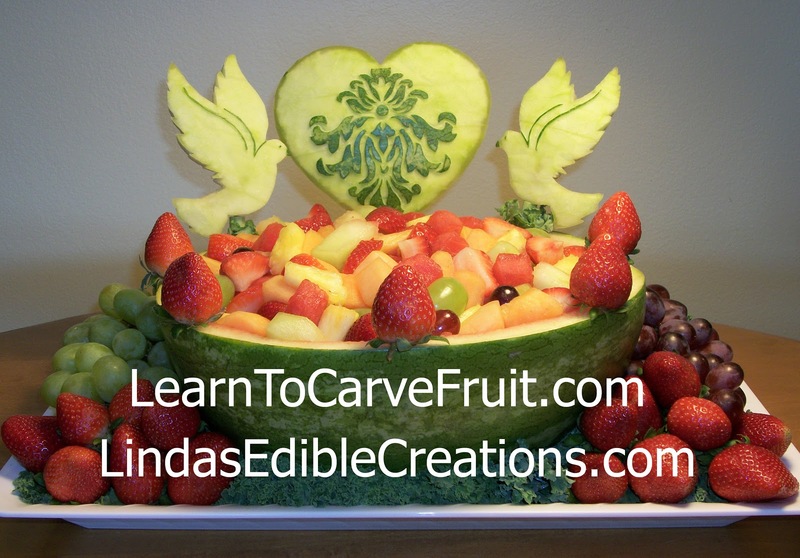 The fruit carving video lessons show you how to make roses out of strawberries (and then chocolate dip them), roses out of tomatoes and other romantic garnishes like hearts and flowers. 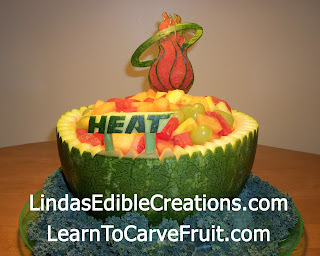 I have noticed that I seem to get basicly the same questions over and over again about fruit carving and vegetable arrangements, so I have decided to collect some questions and answer them. I figure if one person asks a question, there are more people wondering the same thing but will not ask. Please add your question to the comment section below and I will be answering all your questions soon!